One dozen Port Orford Cedar shafts that have been hand-planed to look like ancient primitive shafts. 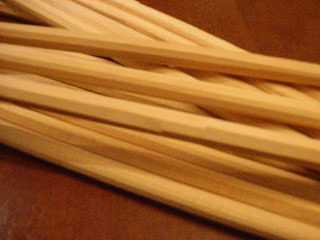 Note that these do not have a nock or groove applied for the point or string. These shafts are full length and will make the best gallery and specimen arrows. These are non-spined shafts and are not sold for shooting or sport archery, but for the making of fine replica primitive arrows. These are blanks 31 inches long, suitable for Eastern or shorter Plains style replica arrows. They are not nocked, painted or grooved with lightning grooves but are whole hand planed shafts -- you finish and decorate them for whichever replica style you prefer. NOT FOR SHOOTING, but these will make fine replica, award and specimen arrows. $12 per dozen, in poly bag. note for those wanting to make shootable arrows - arrows for shooting should be of appropriate flexibility for the strength of the bow that shoots them and free from both surface alterations and defects in the shaft body as these can make an arrow weak and prone to snap while being shot. If your bow is strong enough a portion of the arrow shaft could penetrate your bow arm and cause grave damage. Shafts with hand planed or carved surfaces cannot be guaranteed or recommended for shooting as the surface is uneven and depending on the bow weight that would shoot them, they are unsafe by modern standards. For that reason we cannot offer these shafts for the purpose of sport archery, even though they are very fine shafts for replica arrows. If you desire spined, graded, shootable shafts prepare to pay several dollars per shaft and try Three Rivers Archery.